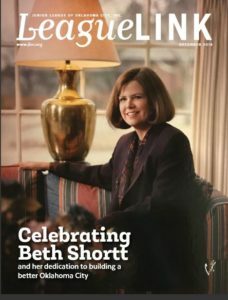 The League Link is published five times a year in March, May, July, September and December. Distribution is to all Junior League members, and local Oklahoma City community and business leaders. League Link’s purpose is to inform members of JLOC news and increase awareness of the League’s projects and events. For more information, contact League Link Editor, Beth Armstrong. ADVERTISING: For League Link advertising rates or for our 2018 -2019 contract, please email media@jloc.org. PHOTO RELEASE: For our Media and Photo Release form, please CLICK HERE. SUBMISSIONS: Please e-mail articles in Word format to League Link Editor Beth Armstrong. Please note that programs such as Publisher are not printable by professional printers. If you would like graphics added to your article, please submit high-quality images in digital format (.jpg, .png or .gif), and a pdf example of how you would like the article laid out in relation to the image so our team can try to create a similar look. Should you need special assistance, please contact the League Link Editor. Photos should be provided via e-mail, disc or flash drive. Media can be loaded onto a CD at any photo studio or copy store for a minimal charge. Preferred resolution is 300 DPI/jpeg file. Please do not provide images from mobile phone cameras, as most pictures are too grainy for publication use. * You must have Adobe Acrobat Reader installed on your computer in order to download and view the League Link archives newsletter.